Dad lovers and dog lovers will both delight in this buoyantly illustrated, tongue-in-cheek tribute to the traits these two species share — and why we adore them. Dad pretends to be human, but the kids know otherwise. Between first-thing-in-the morning scratching, fetching the paper, snacking, lying around for hours, and even the occasional pit stop behind a tree, the evidence is clear. But so are their father’s steadfast love and loyalty. Aren’t those the best things about dads and dogs alike? 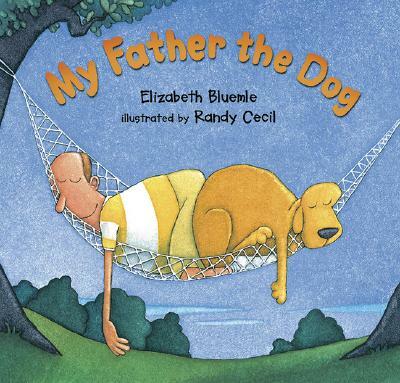 Elizabeth Bluemle’s amusing, affectionate text and Randy Cecil’s delightful illustrations create the ultimate tribute to proud papas everywhere - an irresistible story readers will beg for again and again. ELIZABETH BLUEMLE co-owns the Flying Pig Bookstore in Charlotte, Vermont, with stand-up comedian Josie Leavitt. She holds a Master of Fine Arts degree in Writing for Children from Vermont College. MY FATHER THE DOG is pure fiction, she says. "This book is not based on my very own father. Honest, Dad, it’s not." RANDY CECIL is the illustrator of numerous books for children, including WE'VE ALL GOT BELLY BUTTONS! by David Martin, AND HERE'S TO YOU! by David Elliott, and ONE IS A SNAIL, TEN IS A CRAB by April Pulley Sayre and Jeff Sayre.